On August 23, 1974, John Lennon was very close to finishing his Walls and Bridges album. After working on some of the tracks at the Record Plant East recording studio, he made the short journey home to his penthouse apartment at 434 East 52nd Street. He wasn’t coming home to his wife, Yoko Ono, that day. John and Yoko had separated the previous year, and he was living with May Pang, who had originally been the couple’s personal assistant and was now his lover. It was Friday, and they were looking forward to a sunny New York weekend. They ordered takeaway pizzas for dinner that evening. It was a sweltering summer’s day, and John relaxed naked in the apartment as May took a shower. One of the nice things about that Manhattan apartment was the terrace or observation deck on the roof, which offered a panoramic view of the east of the city. You could reach the observation deck by climbing out of a window, which is what John did on this particular evening. Dusk was falling, the sky was clear, and there was a welcome cooling breeze coming off the East River. Around 9pm, May heard John calling to her urgently from the roof, and she rushed to join him. He was pointing at a mysterious object that was hovering not far from the building. He later described it in interviews as a black or grey thing with blinking white lights round the bottom, and an unblinking red light on top. May would describe it as having the shape of a “flattened cone”. John recalled that it was completely silent: he realised that while he could hear the cars driving on the freeway below, he couldn’t hear any noise coming from the mysterious object, although it seemed to be so close that he could have thrown a stone at it and hit it. May was as naked as John was, and she joked that the extraterrestrial beings in the craft had now concluded that everyone on the East Side habitually swanned around starkers on their terraces; “We look like Adam and Eve!” (I hope somebody was decent when they answered the door to the pizza delivery boy.) At one point, John beseeched the craft, unsuccessfully, to abduct him and give him the adventure of a lifetime. The UFO moved away after a while, and that seemed the end of that. But soon it returned, and John and May set up a telescope so that they could observe it more closely. They also took some photographs, though these failed to develop successfully. As John recalled later, the UFO eventually “went down the river, turned right at the United Nations, turned left and went down the river”. He was so excited by the sighting that he kept returning to the subject that evening. A little-known fact about John Lennon is that he was already interested in the subject of UFOs: he had in fact been a subscriber to Flying Saucer Review since the late 1960s. This is a magazine founded in 1955 and produced in England, which also claims the Duke of Edinburgh as a loyal reader. Sensibly, he didn’t telephone the police or the local newspapers to report the sighting: he knew that if he’d done that, he would have made laughable headlines like “Ex-Beatle Witnesses Flying Saucer”. 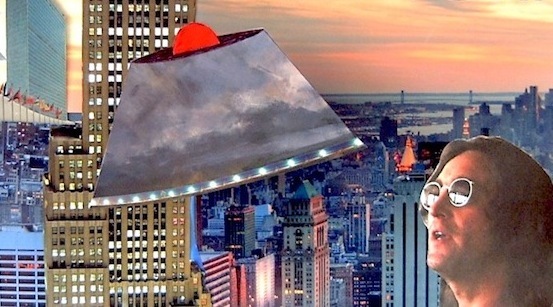 (A friend, the photographer Bob Gruen, phoned around the next day and was told that a number of other New Yorkers had reported sightings of an unusual hovering object.) But he drew some pictures of the experience, later sang about “UFOs over New York” in his song ‘Nobody Told Me’, and was often eager to mention the sighting afterwards, even bringing up the subject unbidden during interviews. Of course, Lennon isn’t the only famous name with a UFO connection. Mick Jagger, William Shatner, Robbie Williams, Victoria Beckham, Kim Wilde and Buddy Rich have all reportedly seen some mighty strange things in the sky. However, the overwhelming majority of UFO sightings are made by non-celebrities. A 1996 poll concluded that 12% of the American population had seen one, which amounts to many millions of ordinary Joes and Janes. And in August 1974 alone, there were all kinds of peculiar things seen in the skies over New York state, California, Texas, Oklahoma, Illinois, Wisconsin, Arizona and Colorado, as well as over Canada, Mexico, Britain, France, Germany and Australia. Was this a CIA surveillance vehicle, sent to check up on an individual regarded as dangerously subversive? Tony’s new book, The Beatles on the Roof, is out now. You can read about it here, and buy it here. Share the post "I SAW IT STANDING THERE"